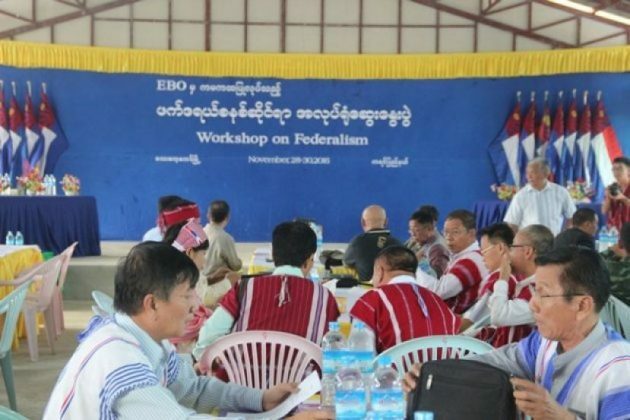 Three Karen ethnic armed organisations (EAOs) and four Karen political parties held their first federalism workshop at Lay Kay Kaw Myothit in Myawaddy Township, Karen State from 29 to 30 November. The workshop was organised by the Euro-Burma Office (EBO) and the Forum of Federation (FOF), 69 people attended. They included representatives from: the KNU, the Democratic Karen Benevolent Army (DKBA), the Karen National Union/Karen National Liberation Army-Peace Council (KNU/KNLA-PC), the Phalon-Sawaw Democratic Party, the United Karen National Democratic Party, the Karen State Democracy and Development Party, and the Karen Democratic Party. During the workshop, FOF discussed: federalism and decentralisation, distribution of power, opportunities for decentralisation, diversity management in federalism, decentralisation and regional governments, schemes for distribution of finances and research relating to federalism. U Khaing Kyaw Moe, a senior FOF trainer, said that ethnic groups have stated that federalism is one of their goals, so they need to know that peace and federalism always go hand in hand. EBO is a non-governmental organisation that is financed by Norway, Sweden, Switzerland, and Finland with the aim of assisting in Burma’s peace process by doing things such as arranging meetings between the Burmese government and ethnic armed organisations and giving training. Since the KNU, DKBA and KNU/KNLA-PC signed the nationwide ceasefire agreement (NCA) last October they have been cooperating more with international groups, social organisations and experts helping them to hold workshops and training sessions that will help the peace process.